Brandt Snedeker’s your winner, coming from one back of Jim Furyk to win by three strokes. This is Snedeker’s seventh Tour win and is a bit of a return to form for him after a down year in 2014. Sunday marked another 4th round disappointment for Jim Furyk. One shot leads are never safe (this piece from Justin Ray makes that clear), but Furyk entered the day as a good bet (~1/3) to win the tournament. An early run of birdies by Snedeker and Watney and two front-nine bogeys by Furyk ended that quickly. This is Furyk’s tenth straight blown 4th round lead. I’ll try to place his 4th round struggles in context. This win earns Snedeker a Masters invitation and should make him eligible for all the no-cut WGC tournaments throughout the year. The fact that he wasn’t already eligible underscores the absurdity of using the Official World Golf Rankings to qualify golfers into major tournaments. Simply put, they do a poor job of adjusting for the strength of the field in each tournament. Does anyone actually think that guys like Lahiri, Jaidee, Gallacher, Bjorn, Jimenez, Warren, and Grace would be able to achieve what Snedeker has playing on the PGA Tour? I think it’s pretty unlikely; those guys feast on the weaker European/Asian Tour events (Lahiri won in Malaysia last week in an event that was barely stronger than your average Web.com Tour field). Non-elite PGA Tour players like Snedeker get hurt in the OWGR because if they’re not winning events, they’re losing ground to inferior Euro/Asian based players who are winning against these weaker fields. Regardless, Snedeker’s win allows us to again appreciate his achievements. Only Bubba, Rory, and Tiger have won more on Tour since 2010. Snedeker has been outstanding at putting ever since joining the Tour in 2007. He’s in that truly elite group with Luke Donald, Aaron Baddeley, and a few others. However, his emergence as major factor on Tour is all down to his improvements off the tee in 2011. Prior to that year he was short off the tee, hitting a solid number of fairways, but averaging only about 275 yards. In the four years since, he’s averaged 280 yards and has retained his accuracy. Five yards might seem like a small amount, but for Snedeker it was improving a clear deficiency in his game to average. He definitely had a down year last year after the standard he established from 2011-13, but most of that can be chalked up to his worst year with the putter since 2008. Putting bounces around year to year, but the guys who are consistently elite tend to retain that ability. In 18 rounds so far this year, Snedeker is back to putting as well as his career numbers suggest he should. I wrote about him as a big candidate to dramatically improve this year because of his record of top level play in more recent seasons. Furyk's been the 10th worst in 4th round/near the lead (< 4 back) since '08. Notable others Watney (6th), Keegan (8th), Kuchar (11th). Those were the numbers from 2008 up until July 2014. Re-running up until present, the numbers look pretty similar, but Furyk falls to the 6th worst of anybody with at least ten 4th rounds played starting within three strokes of the lead. Whether these numbers reflect actual clutch ability or just the way the cookie has crumbled is outside the purview of this piece. What is clear is that they drive a lot of the narrative around who knows how to win and who doesn’t. The performances of Keegan Bradley, Jimmy Walker, and Bubba Watson have been largely comparable in the past few seasons, but Bubba has two majors, Jimmy Walker has a bunch of wins, and Keegan “needs to win more”. Moving back to Furyk, his record is pretty awful at this point; ten straight blown 4th round leads since 2011, including three now (Canadian, Barclays, and Pebble Beach) just since July. His struggles haven’t been consistent in one area either; he blew the Canadian Open with awful putting (-2.4 strokes gained) despite a strong day tee to green, while he putted great at the Barclays, but couldn’t bring it tee to green. Yesterday was another miserable day on the greens (-3.0 strokes gained), but he didn’t do himself any favors off the tee, hitting into two fairway bunkers leading to bogeys and that shot that rolled down the slope on the gettable par 5 6th. 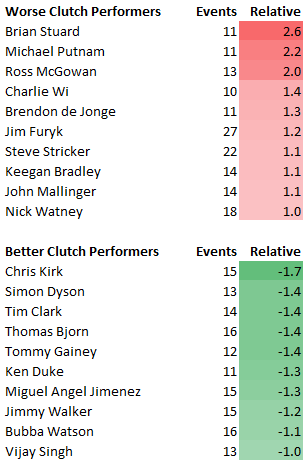 In the Justin Ray piece I referenced earlier, he shows that Furyk’s career “clutch” record was actually very strong (10 wins in 17 opportunities). He appears on the not-clutch list alongside several other elite players. Much of Furyk’s late-career legacy will be decided based on these clutch moments going forward. He’s so good otherwise that he’s going to end up near the top of another half-dozen leaderboards this season. It’s all about finding a way to close out.